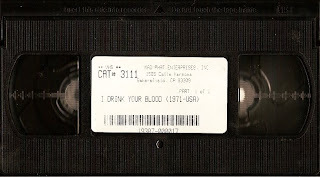 Here's an odd tape dupe of David E. Durston's stupendously great I Drink Your Blood I ran across sometime recently. It's from "Mad Phat Productions" in a generic black slipcover and obviously was made before Box Office Spectaculars/Grindhouse Releasing's definitive SE DVD. The beginning has el-cheapo camcorder-written text stating "Video Images presents A Video Yesteryear Presentation". The film is cut running around 70 minutes (maybe even shorter with what I'll describe next) from its uncut 83 minute digital disc incarnation. But here's the kicker, the film has several impromptu intermissions for reel changes and these don't appear to be added in for nostalgic effect. A scene will end and a black text screen will appear saying "One Moment So We Can Change Reels" and then total black for like two or three minutes. Suddenly the video flickers, reverts for a second to the stand-by blue screen of whatever VCR used to make the recording, and then a few more seconds of fuzzy black before the film begins again with the opening of the next scene. What!?! The last example of such a break is in-between the scene in which the lead couple have a conversation and when Sue-Lin sees the rabid Bhaskar and lights herself ablaze (the actual immolation shots are cut out). I've never seen such an flat out odd thing before. Wow, that is quite the find!